I didn't find much silence today. Somehow my day was quite loud. But this verse, posted originally by a friend, spoke volumes to me. When life is heavy and hard to take, go off by yourself. Enter the silence. Bow in prayer. Don't ask questions: Wait for hope to appear. Don't run from trouble. Take it full-face. The "worst" is never the worst. 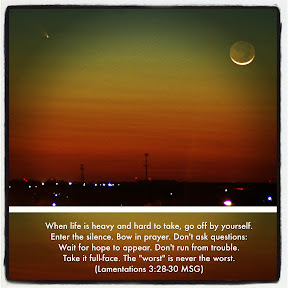 (Lamentations 3:28-30 MSG). Somehow it seemed to go perfectly with a photo my friend, John, captured this evening of the comet appearing over Carthage, Mo. He had to stop, and wait - and probably, if he's honest, being silent - as he worked to capture this once in a lifetime moment. So both remind me that sometimes God tells us to wait.... and even though it's not easy, I truly believe it will be worth it.